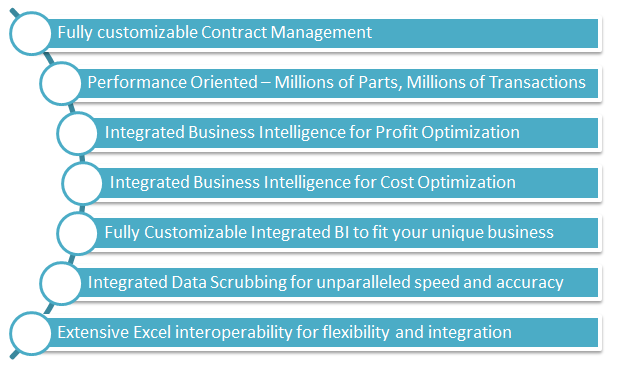 Echelons RFP / Contract management software was specifically made to incorporate best of breed profit optimization business intelligence throughout the RFP lifecycle. The key to receiving maximum benefits from this type of software is a tight integration with normal business workflows. Echelon focuses on analyzing and optimizing every contract deal to maximize profits and cut costs. Our clients have consistently achieved ROI results over 10x, with many results far surpassing that multiplier. No two businesses are exactly the same, and neither should the software that runs those businesses. Echelon can easily be customized to truly fit how your business operates and provide optimal ease of use and maximized results. We pride ourselves on providing the best solution for each business, and this simply will not happen without detailed, expert analysis and a solution that is custom tailored to your organizations unique requirements. Performance is crucial to winning as many contracts as possible. If your team is unable to respond to RFPs by their respective deadlines, your company won’t even be in the running for those contracts. Echelon helps your organization respond accurately and timely to as many RFPs as possible, giving you the greatest opportunity to best your competition.